I made this lil’ guy for my 16yo daughter–who loves penguins–with the intention of putting it in her stocking, but he was so cute, I didn’t want to wait. 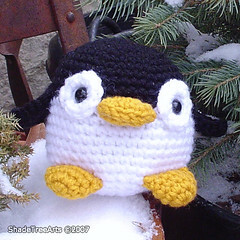 The pattern is on Lion Brand’s site for free (with an account), and can be found here: Amigurumi Penguin. 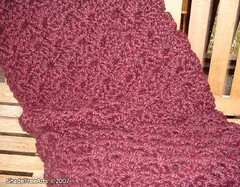 The pattern can be found in the January ’08 issue of Crochet! magazine. 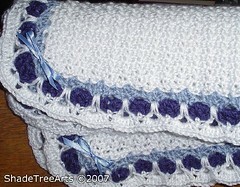 I plan to make a pair of booties and a little hat to go with it, as well as some bibs and wash cloths. It’s also a Lion Brand pattern using their S-35 hook. It was quick and easy & the blanket is super-soft. It’ll be given to one of my step-daughters and her husband. I still have crocheting to do for the holidays, but my project list is actually getting shorter…finally! I love your Amigurumi! Very cute!